A silver Roman Republican denarius of Q. Fabius Maximus, c.127 BC. 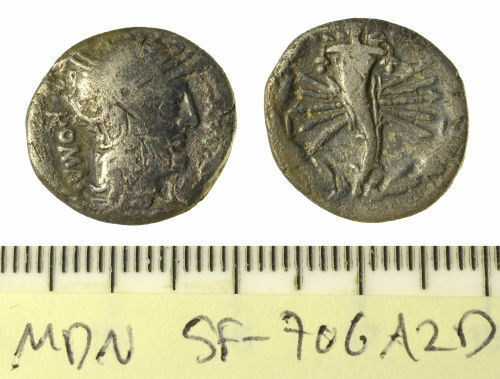 Reverse: Cornucopiae on a winged thunderbolt, within a wreath. Mint: Rome. As Cr265/1; Syd. 478. Republican moneyer: Fabius Maximus, Q. A silver Roman Republican denarius of C. Vibius C. f. Pansa, c.90 BC. As Syd 683b, Cr342.